In recent years, we have been witnessing a shift towards a modern nomadic lifestyle with a less-is-more mentality. One of of minimalism, sustainability, and adventure. Vanlifers are building their homes within a structure of simplification, utility, and mobility with a functional and dreamy aesthetic. With a vast array of modern off-the-grid conversions like solar panels and battery powered appliances, they are in fact reducing their carbon footprint. Vanlifers experience exploring freely and simply, breakfasting in the mountains, and by sunset, preparing food in a converted and compartmentalized kitchen by the oceanside. Check out these beautifully designed modern interiors! Converted wood floors and perfect pastel details create a clean, peaceful ambiance with radiant light shining through each wall surface and a converted skylight. 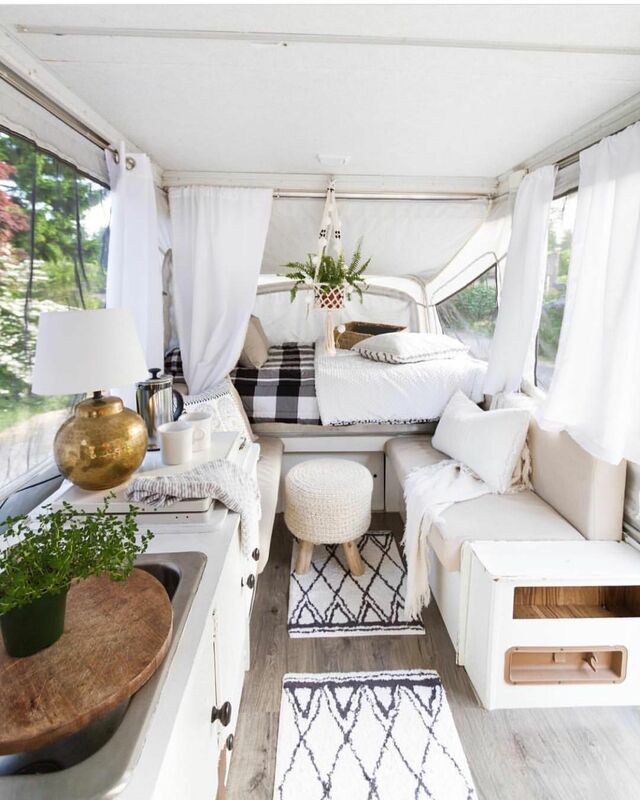 Adding modern boho throw pillows and houseplants for a touch of color is the perfect way to make your Vanlife cozy and inviting. Notice the blush paneling and turquoise details give this interior a warm, Caribbean vibe! The bright whites of the dishes, shelves, and the exquisite handmade Guatemalan area rug in contrast with the lovely green details of the peace lily and succulents, give this converted kitchen a modern bohemian “staycation” mood. This extraordinary interior design combines modern and #jungalow elements, with clean white linens and countertops, white modern boho woven rugs and throw pillows, with a touch of lush plant life in macrame hanging cradles. The glowing brass lamp is an excellent touch to give this environment a high-end accent! An array of earthy tones from the wooden countertops, diagonal shelves, red gradients of the floor, and woven wicker storage baskets, bring a warm contrast with the fresh whites of the walls and ceiling. The converted skylight gives the perfect sun-kissed glow for perfect natural lighting. Miniature gas stoves and wooden countertops enable a way to be portable and gourmet! The rustic wood details of the shelves, benches, and door of the refrigerator create a homey feeling instantly! Combine modern and boho elements from dark chocolate wood floors and shelves, tile mosaics, titanium appliances, macrame plant cradles, minimalist light fixtures, and Japanese bamboo shades. Work remotely in your converted lounge seating, with a natural backdrop enabling focus, peace, and quietude. Curl up with hand woven Guatemalan blankets and throw pillows, with a view of the forest just outside your windows. Whether you decide to convert a Westfalia, VW Bus, or a Sprinter, you are choosing to exist in a tiny home, with a tiny footprint. Vanlife is a playful lifestyle on the road, chasing the horizon and challenging yourself to a journey both outward and inward. What are your experiences with the Vanlife lifestyle? Share photos of your converted van, and adventure stories below! Next Mid-Century Modern Palm Springs, Para Siempre!